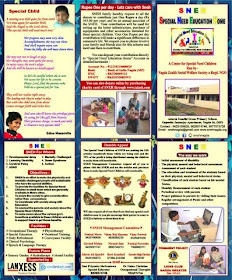 The SNEH (Special Need Education Home) opened its doors in Nagda Jn. (MP) India on July 10th , 2009 starting with only eight children. Currently The Centre serve 25 children and look forward to accommodating up to 100 children. The Centre runs under the Nagda Zenith Siocial Welfare Society, a registered NGO (Reg. no. 07/33/05/07241/07) under the MP society registration act 1973 by the Govt. 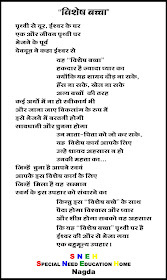 of Madhya Pradesh. This website sets out the aims of the Centre, the way in which classes are grouped and the goals and aspirations of the Therapy Departments and Vocational Programmes at The Centre. Whilst every school needs the discipline of structure based on chronological age, we are acutely aware of the need to be very flexible in our dealings with our special needs children. At all times we aim to meet the individual needs-and maximise the potential of each and every one of our children. We stress the importance of working with parents to create a harmony between home and school, and to ensure that we are all working towards mutual goals. Parents attend parent-teacher meetings twice each year, where they get an opportunity to meet every member of the trans-disciplinary team dealing with their child at SNEH. On-going professional development and in-house training are stressed to maintain the quality of the programme. We hope you will find this website of real value and interest, and we look forward to your continued support. All the best for your future.Your teachers are really hard working towards children of SNEH. We want to know more about SNEH.we r hope your socitey going on a good direction.I want to do something for sneh,how can I do.